British Prime Minister Theresa May says she is calling off a key Brexit vote in Parliament scheduled for Tuesday that has been building for weeks amid increased infighting among politicians within and across all major political parties. The so-called “meaningful vote” was intended to give MPs a say on the deal that May had negotiated with the European Union on the nature of how Britain would exit the EU. The U.K. voted in 2016 to leave the EU by 52 percent, the first country ever to do so, sparking a fraught years-long political and legal process to exit the bloc. May’s government said the agreements meet the key aspirations that Brits demanded upon voting to leave the bloc, while doing minimal damage to the U.K. economy, which is deeply intertwined with the EU. However many MPs are bitterly opposed to one major clause in the agreement -- an insurance policy designed to keep the British union in one piece and Northern Ireland within in the U.K., should both parties fail to come to a trade agreement within the remaining negotiating period. Known as the “Northern Irish Backstop,” the policy is a mechanism to avoid a hard border between the EU and Northern Ireland that would endanger the integrity of the U.K. The “Backstop” mechanism forces the U.K. continue to honor current EU regulations, allowing for trade policies to remain the same until a more permanent solution is negotiated in the future. But many MPs object to the fact that the U.K. cannot unilaterally withdraw from the “Backstop” -- they need EU agreement to do so, effectively forcing the U.K. to follow EU laws. In a speech to the House of Commons on Monday, May said the government “will defer” the scheduled vote, and hinted that she intends to return to Brussels to seek additional concessions on the sticking points of her deal, although she argued that the agreement she has secured was still the best chance of delivering Brexit. However the Speaker of the House John Bercow said he had heard many MPs complain about the prospect of delaying the vote after more than three days of debates and contributions. He said that there were two options for the government: to offer the House a vote on whether tomorrow’s vote should be delayed or should go ahead, or ministers could refuse to move the business of parliament that is scheduled for Tuesday. Bercow added, however, that the latter option would be politically toxic for the government if it denied MPs a say on such a critical moment in the Brexit process. However, the British media reported that May’s spokesman said the government disagreed, and that no vote was required on Tuesday for parliament to “move on” and vote on Brexit another time. There is some confusion among political analysts and MPs as to how and if the prime minister’s plan to unilaterally delay the vote will work, and it remains to be seen if that is how the government will choose to close out Tuesday. Following Theresa May’s statement to Parliament, she faced grueling questions from angry and frustrated MPs who both support and oppose the deal, arguing for the vote to go ahead. There are also voices calling for opposition leader Jeremy Corbyn to bring forward a motion of “no confidence”in the prime minister. If that were to go ahead, and if enough MPs from Labour, the Scottish Nationalist Party and others agree, the government would fall and a general election would be triggered. 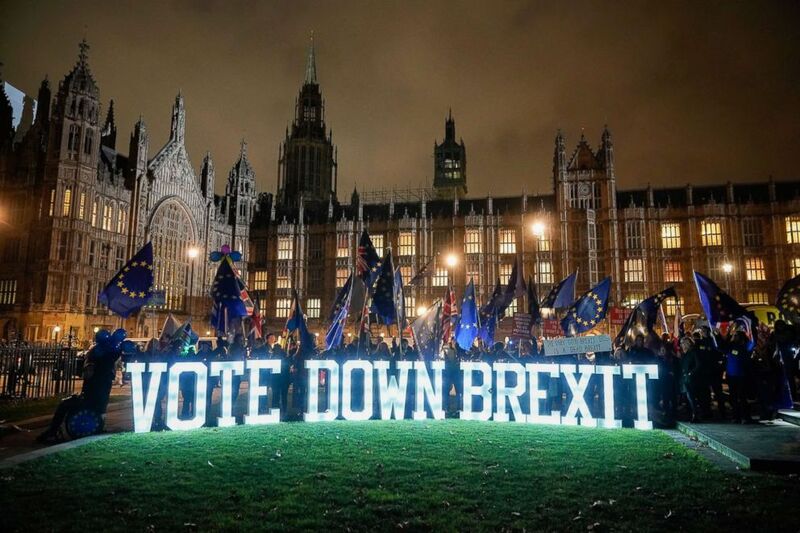 Anti-Brexit protesters use illuminated signs as they demonstrate with placards outside the Houses of Parliament, Westminster on Dec. 10, 2018 in London. “The country is divided not by party but by faction,” said Vince Cable, the leader of the U.K.’s fourth largest party, the Liberal Democrats, on Tuesday in the House of Commons. "What the heck is going on?" thundered Scottish MP Hannah Bardell at the Prime Minister. "Without change [May's deal] jeopardizes the control of our money, our borders, our regulatory independence and our constitution too," said the Conservative MP and former Brexit Secretary David Davis. May faces attack from all sides, including her own party. Political observers have noted prominent Conservative politicians cleaning up their social media profiles, courting media and showing signs of preparing for a leadership contest should May be ousted. Meanwhile, the view from the EU ranges from confused to aghast.